Wood. It’s what’s for dinner, at least if you’re a Termite! The season of cellulose snacking is upon us and we are getting call after call for Termite swarms. 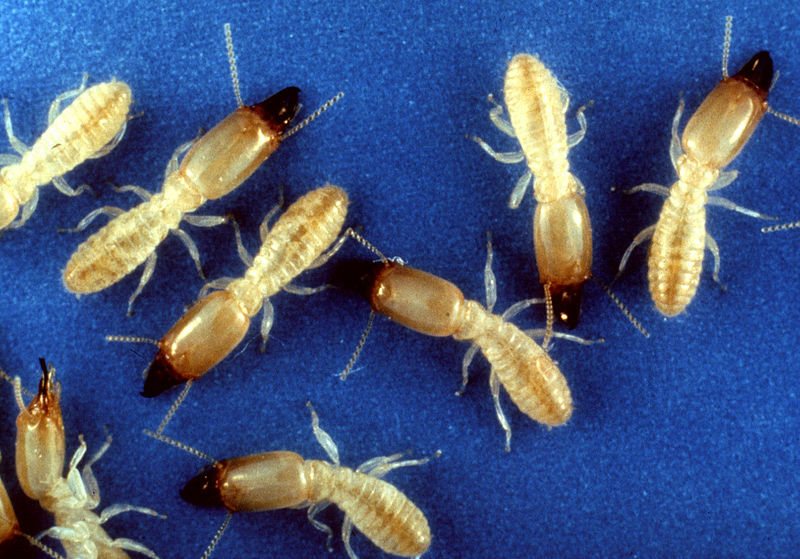 In Pennsylvania, the Termite we see is Eastern Subterranean Termites. Generally they do not feed on a structure that is less than 10 years old, which is good news for new builds. They feed on old roots, old tanbark, tree stumps, fallen limbs/branches and similar materials. Cleaning these up around your home will help prevent termites from making their way inside to do their damage. Once inside, they feed on cellulose materials such as structural wood, paper and any other products related to those. Termite colonies have 3 groups: Workers, Soldiers and Reproductives. Workers – are creamy white in color and stay in the soil and infested wood doing the damage. Soldiers – they guard the openings made in the infested wood and rely on workers to feed them. Reproductives – we refer to them as the swarmers as they reproduce and swarm in the spring, often mistaken to be ants. They are dark brown and black in color and have clear wings on them. The swarms usually occur from March to the end of May. These termites are the ones most seen because they come out of the soil and wood and swarm around doors and windows. Termites create mud tubes/shelter tubes in wood or on the structure of a building to get to the wood. Carpenter ants create wood shavings also known as frass. Termites do not cause wood shavings. Often times homeowners see these shavings and incorrectly think they have termites. Typically the best place to look for termites are in basements and around wood framing in a home. We recommend if termites are found to have the entire structure/soil surrounding the home treated. It is better to spend a couple hundred or thousand dollars getting your home treated than the 10’s of thousands of dollars in repairs to your home from the damage of termites. We’re your locally owned commercial, residential and industrial pest control company, servicing Carlisle, Mechanicsburg, Shippensburg and surrounding areas. Is there something bugging you? Schedule a free consultation with our pest experts to determine the proper treatment for your home or business.